What are Spirit Guides and can they be trusted? I can connect with what people commonly call Angels, which are beings of a higher dimension and vibrational frequency that what we are. Because our vibration is (finally) beginning to rise, many are now connecting and eager for their support, insight, and care. They do not tell us what to do. They do not make our decisions for us. But what they will do, is help us see the bigger picture of things. In our life we often are only aware of our own small space and the things that we feel affect us. While we are aware of others, we often don't view ourselves from the bigger story that is taking place, and that we are all a part of. The Guides also support us so that we learn what we came here to learn, to have greater understanding of all things, and most of all to help us reconnect to the deep Love energy that is so abundantly available. When I do a reading I am in direct conversation with these Divine Higher Beings. I will ask them things on your behalf, and relay to you - word for word if possible - what their response is. They are frank, direct, and always loving. Because they are not human they see the bigger picture of your life. They know what it is you need to hear before you even arrive at my office. And they are hopeful that you will embrace your life and the situations in it, because they remember and know you as Spirit, not just your identity in this lifetime. Readings are between 45 and 60 minutes long, and can be recorded as an mp3. I always inform my clients that any reading is a psychic intrepretation of what's being relayed to me. And while every effort is made on my part to relay the information to you as truthfully as I can, it is VERY important that you make any and all decisions in your life based on what's right for YOU, not from a psychic reading. You can enjoy a reading from anywhere in the world! I often do readings, record them, and then upload them for clients to download and enjoy at any time. The readings will be between 45min - 60 min, and recorded in mp3 format. Then I will upload the reading to a Dropbox folder which only you and I will have access to. After you have downloaded your reading the file will be deleted after 30 days. Payment can be made by e-transfer or credit card by clicking on the button below. The e-mail address to use for an e-transfer is HERE. Would you like to have ongoing 'coaching' from the guides? Now you can, and I'm making it as easy as possible. 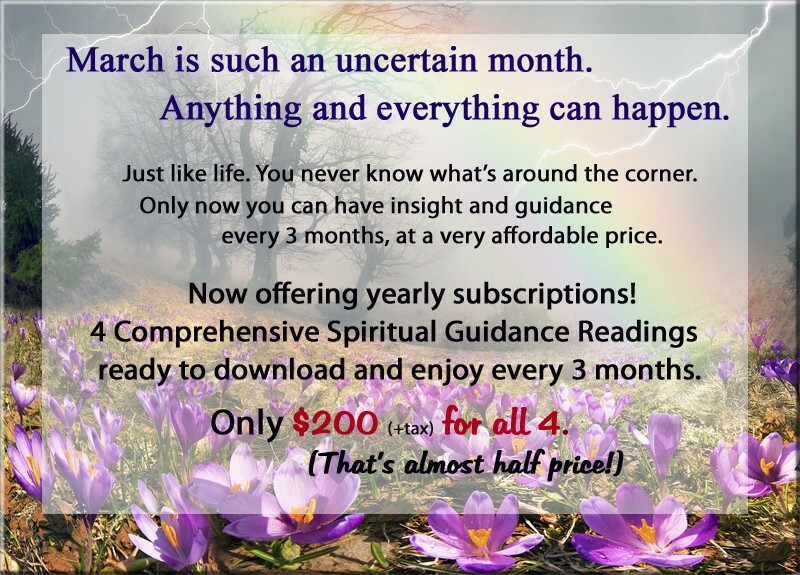 For the month of March, you can subscribe for 4 readings interspersed over 12 months at a great savings of almost 50% off the regular price of an in-studio reading! I will do your reading and upload it to a Dropbox folder that only you and I can access. Your reading will be available for download for 30 days after it is delivered. Once downloaded you can enjoy and refer back to your reading at any time. In 3 month's time, I will do another reading and upload it to the same folder. I will notify you via e-mail when it's ready. Enjoy insights, encouragement, and hear the love from your Spirit Guides throughout the year. Payments can be set up quarterly, by credit card. When you click on the "Subscribe" button you will be taken to PayPal where you can securely make your purchase. PayPal will then charge you $52.50 once every 3 months until a year has passed. In other words 4 payments and 4 readings over a 1 year period. Once I receive your payment, I will send you a welcome e-mail. You can reply to that e-mail with any questions you would like me to ask. Then I will do a complete reading for you, which will go somewhere between 45 and 60 minutes. I'll record it and upload it to a secure Dropbox folder which only you and I can access. Each reading will remain available for download for 30 days, and then it will be deleted. Thank you so much Grace for helping me understand what is happening in my life. Thank you so much Grace once again for the reading. Really puts things into perspective. Will listen to it a few more times to set some things in order. Thanks Grace for the in-depth reading. I really needed to validate some of the feelings I have been trying to suppress over the past few weeks. I know moving forward this reading will help guide and support what lies ahead. Thanks again for the much needed check-in and updated reading.